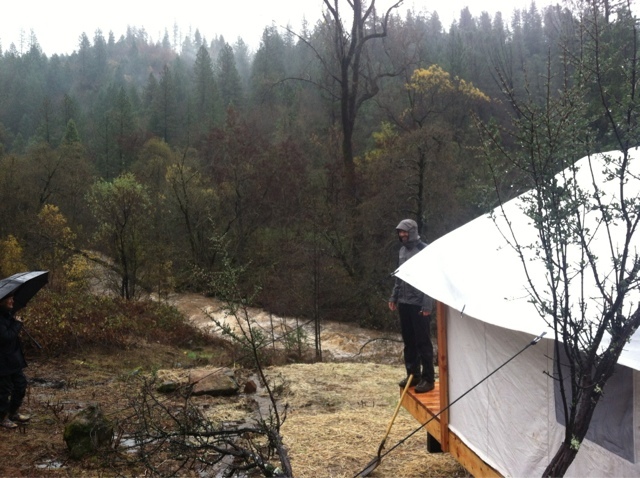 I've had another exciting week or so of work, training, and tent livin'. Well, the tent living was probably the most exciting part of the three this time. I think our area made some national news outlets last week for a storm that came through. 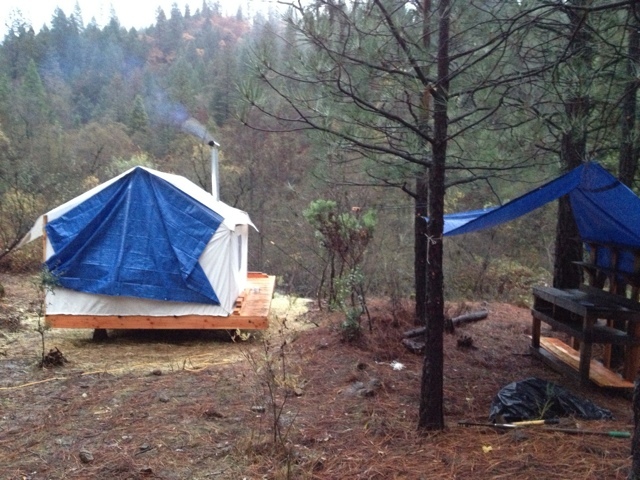 It was a good test of the tent setup- it dumped over 11 inches of rain, and an evening of 60 mph wind gusts. It got interesting. You'll see in the pictures below I hung an extra tarp over the back of the tent. This is a bandaid for a leaking seam along the bottom of the window- rain is able to go through the screen and pool at the bottom seam and leak into the tent. It wouldn't be a big deal if the skies weren't trying to drown me. The tarp looks ghetto, but think its there to stay until I can make sure I waterproofed that seam (and a few other seams around the tent, haha). Anyway, it kept me pretty cozy and dry through the deluge, and with the wood stove going, I had it up to 85 degrees with all the windows open! That's downright sweaty. 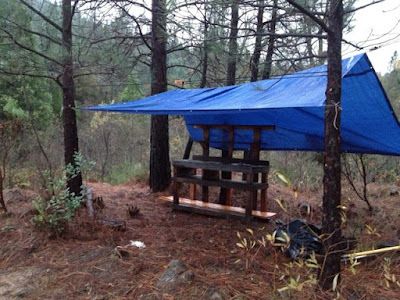 I also set up the "kitchen" area with my outdoor "counter" and a fancy new blue tarp. I unfortunately set up the tarp the day before the nighttime microburst roiled into the area. The wind gusts were so strong and sudden that it felt like someone hitting the structure with a car. I tried to sleep through it when I could, waking up to falling objects and the fly flapping thunderously in the wind. 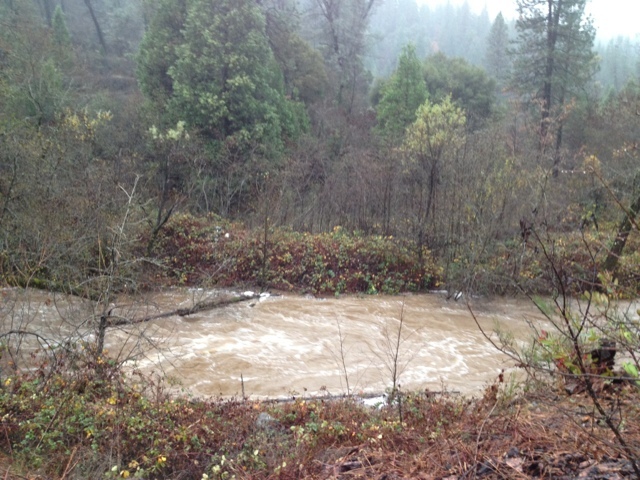 The storm didn't abate until 7 or 8 the next morning, and I was tired enough to sleep in until 10 or so. Upon awakening, I noticed it was suspiciously bright inside the tent. I hurriedly threw on some rain clothes and went outside to find, as I suspected, the fly had been torn off of the tent. On inspection, a line (of considerable thickness and strength) had broken and allowed the others to loosen and the fly to come off. The fancy kitchen tarp was down too, the grommets ripped right out of it. Poor timing on my part? Oh well! The fly is now re-attached with a couple additional lines, and I put a new rain cap on the stove pipe (There was about 3 inches of rain in it after that night- the old cap had been compromised by the wind). I had an exciting night! After persistent, soaking rain for 4 days, I had subconsciously accepted that I was never going to see the sun again, so you can imagine the 15 second break in the clouds the next day was quite lifting. The tent life is going to be what I'm calling an iterative learning process. Should be fun! 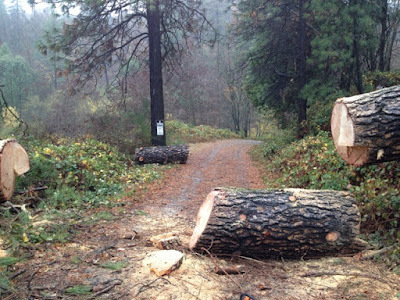 Oh yeah, during the storm, an enormous ponderosa pine tree fell over the road to my tent. I borrowed a small "hobby" chainsaw and spent about 2.5 hours cutting the thing out- the bar was only long enough to go almost half way through the tree. Along the way, I had to cut away this pesky vine and drag it out of my way, not realizing until later that it was, in fact, poison oak. That's all to say that I have awful, itchy welts on a fair portion of my body. Lesson learned! On the training front, I'm feeling great. The cross training and strength training at the gym combined with some light running has me feeling fitter and stronger than ever. It's been a good while since my last long run of any significant length, and I'm itchin to do one soon. Maybe this weekend- Ill let you know! Hey! We are friends of Chris Holcomb and he sent us to your blog. 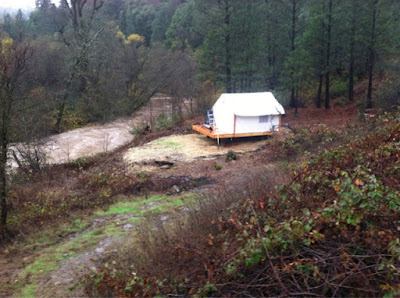 We live in Nevada City area and were very impressed that your tent lived through that fun little deluge! Anyway, if you ever run in to trouble with that tent (not that I think your tent will fail you... although our snow is like cement) or you want someone to hang with just let us know!